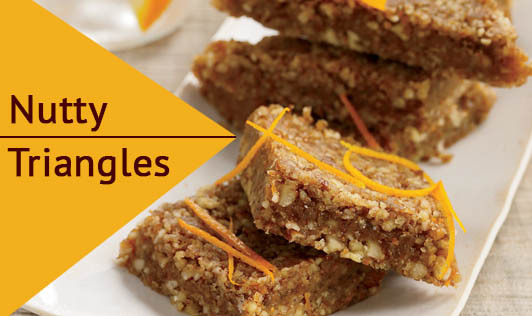 These delicious triangles made of almond and pistachio are a great snack at any time of the day. They provide essential nutrients like protein, fiber, anti-oxidants and vitamin E - making them a must-have for kids. 1. In a heavy bottomed pan, add the sugar and melt it over gentle heat, stirring continuously till the sugar is light brown in colour (caramelised). 2. Remove from the fire, add the rest of the ingredients and mix well. 3. Pour this mixture onto a greased marble or stone surface. 4. Using a large greased rolling pin, roll out the praline as thinly as you can. 5. While it is still warm, cut into triangles. Allow it to cool completely. Note: Remove the sugar from the flame just when it starts to caramelize because it continues to turn brown even after it is removed from heat.